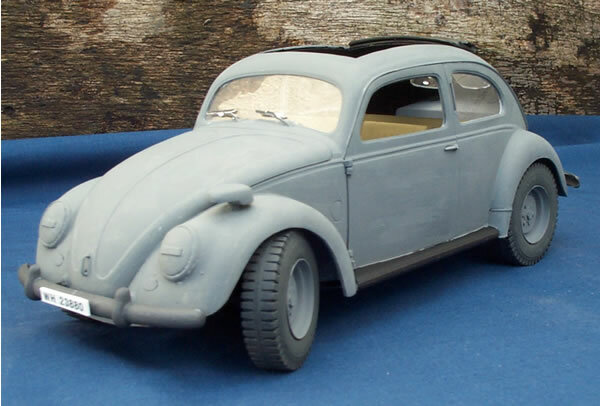 The model used for this quick conversion was the 1/16 Revell VW Beetle. 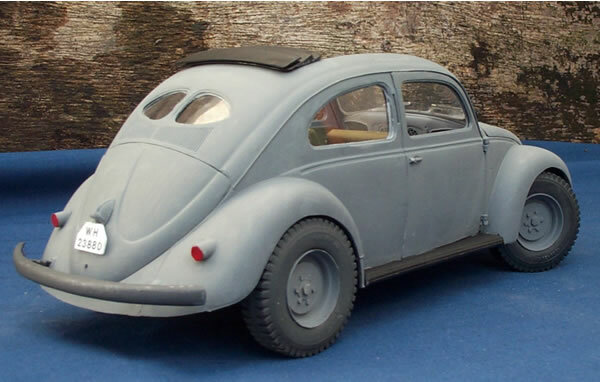 The model was built more or less out of the box and during assembly I dropped the suspension back and front to allow for larger wheels and also opened up the wheel arches by about 2mm. New more basic lamps were added to the rear, a notek light fitted on the top of the front mudguard and a re-arranged top cover from the original. The wheels and tyres are from a 1/24 Italera truck model with new centres added from thin card. I copied the photos found in the Schiffer book as a four wheel drive version. I did not add the steering wheel yet as I am planning on fitting a figure from the Tamiya KW model which I hope can be fitted through the roof along with the steering wheel.